I must admit, when I first heard of the Bearizona Wildlife Park, I didn’t have much interest in visiting. As I fancy myself as a sort of rugged outdoorsman, I prefer my animal encounters to happen in the wild. My wife, however, does not share that sentiment. She had been talking about going to Bearizona for a while, and I was finally convinced to give it a shot when some friends (who are also picky about where and how they view their wildlife) gave it a sterling recommendation. During a daytrip to Northern Arizona in early August, my wife and I decided to take my mom out to Williams and see the park. Upon arriving at the park gate to pay the fee, we were pleasantly surprised to learn that the park has both a drive-thru safari portion and a walk-through portion. With our maps in hand and the fee paid, we were ready for action! Good thing we were ready too, because the action began almost immediately. From the entrance station, we could already see a mountain goat standing in the middle of the road a few dozen yards ahead. The cashier informed us that this goat was the park welcoming committee! Map of the Bearizona Wildlife Park as of 2016. As we drove up to the goat, he blocked the path of our car instead of letting us through. It really did not seem like he was trying to welcome us. My wife was behind the wheel, and she was really worried that he would charge us and ram the car. She tried reversing a bit to give him some space to let us by, but we were now causing a traffic jam as a couple more cars pulled up behind us. Finally, the goat did manage to make some room for us and we were able to squeeze by without a collision. He seemed to like the other cars just fine, so I don’t think were treated to the typical welcome. Despite some “poor customer service” from our goat friend, we headed onward in good spirits. All of the safari sections are signed, of course, so you know what type of wildlife is coming up. Obviously, we passed the Rocky Mountain Goats first, as well as the Dall Sheep in the same little area. The other sheep and goats seemed friendlier than the designated greeter up front! Next, we came to the Rocky Mountain Elk and Mule Deer. I seldom shoot wildlife photos, but I did manage to get one or two cool shots of the deer as they were grazing and drinking from the water trough. For the record, if you spend any amount of time in the forests surrounding the park, you will undoubtedly see these same species of deer and elk in the wild. Mule Deer drink and graze as visitors look on from the road. The next exciting part was the Arctic Wolves. Not being native to Northern Arizona, these white wolves seemed a little out of place among the ponderosa pines. They were just hanging out, mainly laying around in the grass. None of my photos were worth a hoot, but definitely a cool animal to see in person. As we entered the junior Black Bear exhibit, we remembered the warning provided by the nice woman at the gate. She said, “Keep moving in the junior Black Bears, or they will try to climb on your car.” They looked friendly enough, but we heeded the warning a viewed them quickly as we moved on through. No worry, we would see more of these cuties a little later. Around the bend in a big open meadow between the stands of pine forest, we came across the bison exhibits. However, the loop roads out into the meadow were closed due to recent thunderstorms and we were unable to see the bison up close and personal. Juvenile Rocky Mountain Bighorn Sheep enjoying the perfect summer weather. However, we did get a great look at the Rocky Mountain Bighorn Sheep, as they were all lounging right by the side of the road. Their curved horns are especially spectacular! There was even a group of juveniles hanging out that looked cute as can be. Next came the full-grown Black Bears. These guys are pretty big but more well-mannered than their cousins, the Grizzlies. We got a pretty good look at these guys and drove around the little pull-around loop twice to snap some better pictures (and failed at that, of course). One was even trying to cool off in a big water tank! What a character. An adult Black Bear enjoys a cool bath to beat the heat. That was the end of the safari section of the park, but we still had to stop at the Fort Bearizona Walking Area. As it turns out, this was my favorite part of the Bearizona experience! The walking area is set up like a zoo, with exhibits that can be viewed by walking the course. It has other attractions and amenities too, including a snack bar, picnic area, petting zoo, and gift shop. We didn’t make it around to watching it, but they even have a “Birds of Prey” interpretive show. On the day we visited it was scheduled to run at 11:00, 1:00, and 3:00. Interpretive signage provides info about the animals at each exhibit. Although I enjoyed the safari section, I really enjoyed this walking exhibits because you could hang out as long as you want to watch the animals without worry of blocking traffic, or your car becoming a jungle gym for a juvenile bear. Each exhibit has an interpretive sign providing info about the animal, including their native habitat and typical diet. We saw javelinas, foxes, skunks, bobcats, badgers, porcupines, and otters just to name a few. But the real highlight here was the bear cubs. One of these “little” bears was sitting on a rock not too far away from the fence and made some funny faces that made for the best photos during our time at Bearizona. A black bear cub hams it up atop a rock for park guests. The last highlight for me was our stroll through the “nocturnal mine shaft” where we saw some creepy crawlies, but also a look at the Ringtail Cat. It isn’t actually a cat, it’s a species of raccoon, but it happens to be the state mammal of Arizona. It’s also really cool looking, at since I haven’t ever seen one in the wild, it was pretty cool to get a real life glimpse. Before we left, we just had to walk through the gift shop, and I ended up grabbing a neat t-shirt as a souvenir. Of course, they have all sorts of wildlife themed goodies and an especially impressive collection of stuffed animals for the kids. Ringtail Cats relaxing in the dark. As we exited the park, we all agreed that we had a fantastic time and definitely bring some more of the family next time we are in the area. 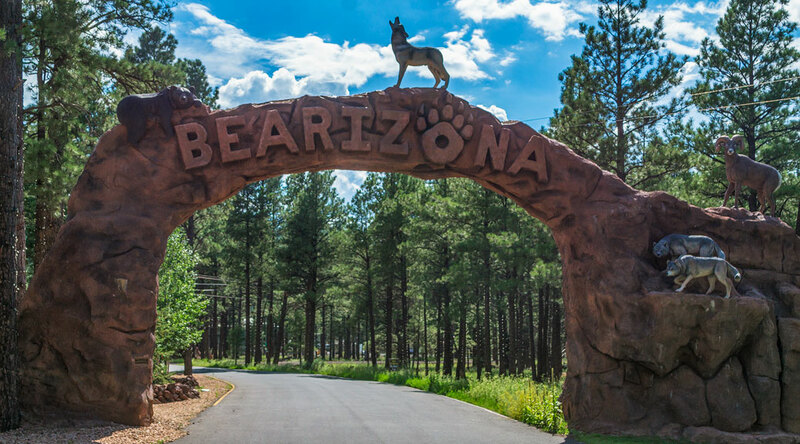 We recommend a trip to the Bearizona Wildlife Park for anyone passing through Williams, and visitors to the Grand Canyon South Rim might find it be a nice addition to an unforgettable trip to Northern Arizona. Admission Booth Hours (as of 2016): 9am – 4pm. All guests must exit by dusk.